An exhibition featuring four prominent Cincinnati artists. Jimi Jones is a Cincinnati artist and graphic designer. He is a graduate of the University of Cincinnati College of Design, Art, Architecture and Planning and recently retired after a 27 year career as an art director in charge of display design at Procter and Gamble. He was a founding member of the Neo-Ancestralist art movement with exhibitions at the National African American Museum, Wilburforce, Ohio, The University of Cincinnati 850 Gallery, Thomas More College, the Cincinnati Arts Consortium, the Weston Gallery at the Aronoff Center for the Arts and numerous shows at the Contemporary Arts Center. The 2008 exhibition at the Weston Gallery was his first major individual exhibition. “Most of us spend at least a part of each day staring at a computer screen trying to absorb information; information that is made up of millions of pixels. Viewed up close, each pixel has no meaning. It's only when we pull back and look at the screen as a whole that the pixels turn into recognizable images and absorbable information.As a million pixels make up a viewable screen, a million thoughts about the world run through my head each day and are interpreted in my paintings. Unlike individual pixels, each of my paintings can stand alone. Like individual pixels, each of my paintings is part of a much bigger concept. Cedric Michael Cox is best known for his paintings and drawings which fall between surrealism and representational abstraction. His work expresses themes ranging from mythical literature to the relationships between the physical body, musical allegories, natural, and man-made landscapes. As a student at the University of Cincinnati’s College of Design, Architecture, Art, and Planning, Cox was awarded a fellowship to study at the Glasgow School of Art in Scotland. After receiving his BFA in Painting in 1999, he began to exhibit locally and regionally. Cox has had solo exhibits at the Contemporary Arts Center, the Carnegie Visual and Performing Arts Center, The Taft Museum of Art, PAC Gallery, and Weston Gallery in the Aronoff Center for the Arts. In support of his efforts in the visual arts and art education communities, the City of Cincinnati awarded Cox the Individual Artist Grant in 2009. He received a Congressional Award in 2010. His art has been featured in magazines, on television, and in the college textbook Drawing: Space, Form, and Expression. In addition to his work being in corporate collections, Cox executed two large-scale public murals for the city of Cincinnati and murals in various Public Schools in the Cincinnati region. His recent exhibits include the Museum of Science and Industry Chicago, the Phoenix Gallery in Chicago, Sacramento’s Evolve the Gallery, the Harlem Fine Art Exhibition, the Williamsburg Arts and Historical Center Brooklyn, NY, the National Arts League, Douglaston, NY, and The Robeson Gallery at Pennsylvania State University. 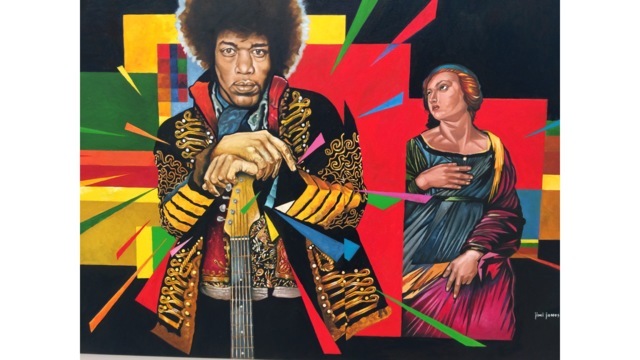 In 2013, Cox returned to Chicago for the Black Creativity Exhibition at the Museum of Science and Industry and in July of 2013 Cox had his first solo exhibition in New York at Five Myles Gallery in Brooklyn. In 2014, he returned to New York exhibiting his work at the Skylight Gallery, Arcilesi/Homberg Fine Art and later that year he had a retrospective of his work at Northern Kentucky University followed by an exhibition at Thomas More College in 2015. The Dayton Art Institute awarded him the Yeck Artist In Residence in 2015 and in 2017, Cox had a solo exhibition at The Taft Museum of Art and continues to exhibit his work locally and nationally. Ricci Michaels is a Navy veteran and legally blind. Continually overcoming personal challenges and becoming an inspirational catalyst for others, both young and old, pieces of her work have been collected by notably strong women, such as Maya Angelou and Esther Rolle. Celebrated locally for her contribution to the community, her work is shown in such prominent galleries as The Art Beyond Boundaries Gallery, The Cincinnati Art Museum, The Cincinnati Freedom Center, as well as the University of Cincinnati’s Law Library. Not limited in her approach, as Director of the Urban Expression 101 Project, a community outreach program that promotes healing thru the arts with a focus on woman, veterans and those coping with the effects of PTSD; Ricci Michaels believes self-expression is vital to the human spirit and works continually to provide a platform that inspires and enhances the quality of that expression as her purpose. “I believe in channeling my creative urges in order to produce unique artwork in Cincinnati. The inspiration for my work is the miracle of life. "Ricci Michaels'" is born out of the combination of my own life experience containing choices made for and by me, which forces my perspective as an artist to delve into blatant realms of yet unexplored life. Read an excellent article published in Cincinnati Magazine HERE on Terence.